ABC Companies had plenty to talk about at this year’s UMA Expo in Orlando, Fla., including marking the 25th anniversary of its longstanding partnership with Van Hool partnership. Having signed their very first distributorship agreement in the late 1980s, ABC Companies took delivery of the Van Hool T815 motorcoach and started a new revolution in European technology designed for American operators. Since then, both companies have worked at a relationship that has endured through several generations for both families and a number of important milestones for the coach industry. 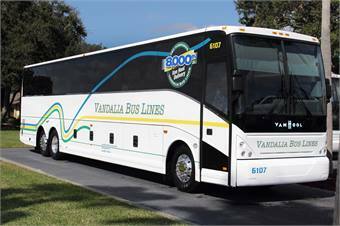 ABC Companies also commemorated the sale of its 8000th Van Hool coach built for North America to Vandalia Bus Lines of Caseyville, Ill., a 2013 Van Hool C2045. The 8,000th Van Hool is equipped with a Detroit DD13 engine, Allison B500G4 transmission, a luxury entertainment system with 15-inch flat screen TVs, three-point seatbelts, Iteris Lane Departure Warning System and Electronic Stability Control. Other announcements made at UMA Expo, included ABC’s new QR code program that will link operators directly to its mobile site for driver resources, the increased focus on its refurbishment program, and a new option to connect with ABC CustomerCare during business hours using video conferencing services Skype and/or FaceTime. Finally, the company also recently announced that Van Hool nv appointed Filip Van Hool as the company’s CEO. As such he will bear operational responsibility for the overall activities of Van Hool. Filip Van Hool will remain a member of the board of directors.